How Cool Parents Deal With All That Halloween Candy | Hold On Daddy's Coming! I have to admit that I absolutely love hearing about what parents do with their kids’ Halloween candy. Why? Because whatever a parent does with it says so much about how cool they are. And being cool is obviously very important to Jackie and I – that’s why we wear matching shirts. Anyway. Last night, we took Jimmy and Riley out trick-or-treating for the first time (obligatory mention of the fact that our kids looked adorable). Those two babies accumulated quite a bit of candy in just 30 minutes time, which got me thinking: what the heck am I gonna do in a few years when they start filling pillowcases with Skittles, Almond Joys, and Twix bars? Until I was about 12, I went trick-or-treating with my brother. After hours and hours of effort, my parents would take our candy and dump it all into one drawer – a drawer with restricted access. For a month of two, we could only tap into the drawer for one or two pieces of candy after dinner. It was basically communism. While my parent’s approach saps out the incentive to snag as much candy as humanly possible on Halloween (cuz I knew everything I “earned” would be shared with the rest of the family), it didn’t stop me from…well…snagging as much candy as humanly possible on Halloween. Another obvious benefit is that my brother and I didn’t have hoards of candy at our disposal with which we could totally destroy our appetites and teeth. But since when have economists known what the heck they’re talking about? There’s also the “pure” capitalist approach, whereby each child not only keeps what he or she has collected, but can also take that candy into their own bedroom at any time. To a kid, candy in the bedroom is key. In terms of being a cool parent, this approach is by far the most superior. As a child, I was always jealous of other kids whose parents took this hands off approach. These were the same kids who had bedtimes well after 11pm, ate “Lunchables” and Oreos every single day, and watched rated R movies when they were 10 years old. So lucky! But here’s proof that kids shouldn’t be responsible for their own candy consumption: when I was a kid, I hated black licorice (and still do). And yet when we got to the bottom of the candy pile, I still ate it! To recap: I hated it, and it was bad for me, but I still ate it because it was in front of me and it was candy. Kid rule: horrible candy is better than no candy. And now that I have two of my own, I’m not sure which route to take. The Republican in me thinks the government (me) should stay out of the private sector (Jimmy and Riley’s earnings). But the concerned parent in me says perhaps Stalin knew a thing or two when it came to Halloween candy distribution. And then common sense says: why the heck am I even equating Halloween candy distribution to different forms of government in the first place? Here’s another approach I’ve heard: let the kids indulge in their own candy for a few days (say, three), and then throw it all away. Here, the kids see an immediate benefit to their hard work, while the long-term effects of overconsumption are mitigated by the three day rule. To a kid, this is obviously a horrible plan. I mean, even kids know the old “bait and switch” when they see it. First and foremost, I give him props for the creativity. I mean, incorporating the Easter Bunny into Halloween? Never would have seen that coming! 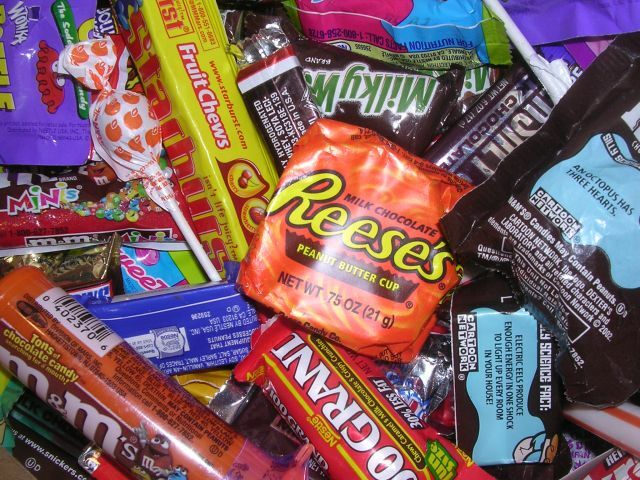 Secondly, as a kid, a candy-for-video games trade might actually have been something I’d have been willing to consider – especially after several days of feasting on peanut butter cups. The other problem with this Easter Bunny encounter is that it associates Halloween (evil demons) with Easter (Jesus). Not that the Easter Bunny has anything to do with Jesus… Either way, it’s official: we won’t be employing this tactic in our household. Here’s another approach: let them have a few pieces of candy on Halloween, and then throw it all away that night. This is great for cavity prevention, and devastating for morale. Needless to say, I would *never* do that to Jimmy and Riley. Even if I wanted to, Jackie wouldn’t let me (and she would be quite right). I mean, if my parents were communists, and other, more permissive parents were pure capitalists, then this approach would make me some kind of tyrannical monarch. It’s just un-American. Regardless of what we choose to do, my kids will likely catch on to the value of one activity common to all forms of government: bribery. Yep, I’m a sucker for bribes, and I just might be willing to trade some leniency for a few pieces their finest candy. They just better not tell me all they have left is black licorice! 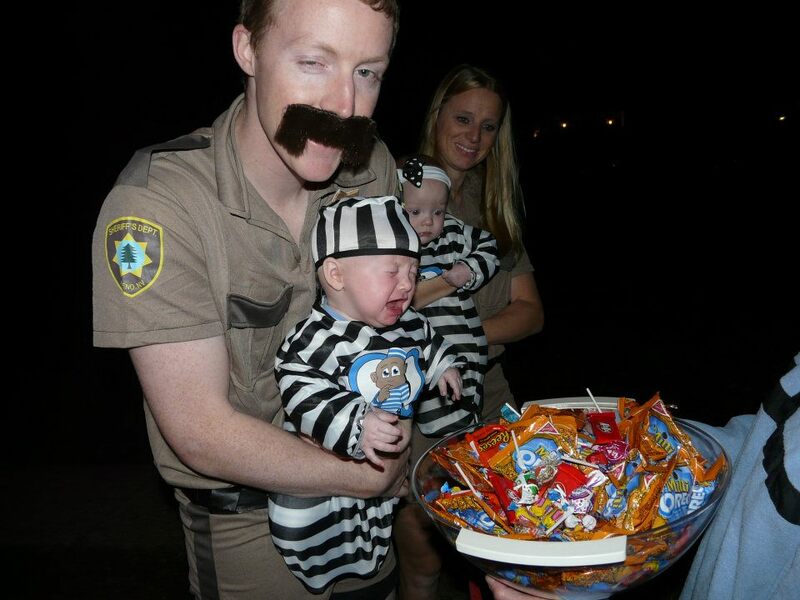 Dont cry, Jimmy, I’m not gonna steal all your candy!